throughout the museum. Check your attics and basements, we would appreciate your help. We now have Apple Butter for sale at the Museum, the cost is $5 a pint and it is delicious. Come in and get your winters supply before it is all gone. Our next Euchre tournament and dinner will take place on Saturday, November 23rd at Terry's Cafe located at Woodbury just north of the corner of M43/50 and M66 on the East side. Dinner will be served from 5 – 6 p.m. and Euchre will begin at 6:30 p.m. sharp. The cost will be $10 for dinner and $5 for Euchre. You do not have to join us for dinner to take part in the Euchre Tournament, just be there and ready to play Euchre by 6:30. We will also have 50/50 and raffle drawings throughout the evening. In the Lakewood News this week look for a coupon to bring to the Euchre Tournament and receive a coupon from Terry that you can use on your next visit at Terry's Cafe. Come and join in on the fun, all proceeds go toward the Museum Roof Fund. The museum has been a busy place and we hope you will stop in and see what has changed, our hours are Monday 10 - 4, Wednesday 2 - 5 and Saturday 10 - 2. If you have questions please call Wendel (517)449-6018 or Jan (517)449-4895. We all survived our busy week with room to spare and ended with a successful Trunk or Treat with the children of Sunfield and surrounding areas. They started Trick or Treating about 5:30 and ended close to 8 o'clock. We thought we had enough candy and cookies but when the lines got longer and longer we got out the cotton candy machine and put it to work. Thank you to Wendy Mater and Doris Feasal for stepping in and helping us out when the lines got long. We appreciate your help. Last week I promised I would tell you about a special event that will be happening at the end of this month, November 24th to be exact. Dana Troub will again host a Community Thanksgiving Service at the museum. We will have as our special guests, Lieutenant Governor of Michigan, Brian Calley, The Cold Water Brass, Karen Raymond, Bob Harms & the Sunfield United Methodist Church Choir plus other surprises. We hope you will plan to join us at 7 p.m. November 24th at the Sunfield Museum. Everyone is welcome. More next week. We have been using the switchboard to delight those that are interested in the old telephone service we had in Sunfield until 1972. We have 5 telephones that are connected to the switchboard and when you come in you can ring up the operator and make your call. Everyone is having a great time with them and we would like to ask if you have a spare box telephone you would like to find a new home for or loan it to us, we would appreciate your help. Our next Euchre tournament and dinner will take place on Saturday, November 9th at Terry's Cafe located at Woodbury just north of the corner of M43/50 and M66 on the East side. Dinner will be served from 5 – 6 p.m. and Euchre will begin at 6:30 p.m. sharp. The cost will be $10 for dinner and $5 for Euchre. You do not have to join us for dinner to take part in the Euchre Tournament, just be there and ready to play Euchre by 6:30. We will also have 50/50 and raffle drawings throughout the evening. Come and join in on the fun, all proceeds go toward the Museum Roof Fund. The museum has been a busy place and we hope you will stop in and see what has changed, our hours are Monday 10 - 4, Wednesday 2 - 5 and Saturday 10 - 2. If you have questions please call Wendel (517)449-6018 or Jan (517)449-4895.
to Kevin & Celeste Atherton who also donated apples and to everyone who brought us jars, without your help and donations we would not have succeeded. With everyone's help the process went smoothly, and this year it has an exceptionally good taste. Come on in and get your pint (or two) before they are gone. The Euchre & Dinner Tournament at Terry's Cafe in Woodbury on Saturday night went well. The next scheduled Euchre & Dinner event is scheduled for Saturday, November 9th and Spaghetti Dinner is on the menu. Dinner will be served from 5 – 6 p.m. and Euchre will begin at 6:30 p.m. sharp. The cost will be $10 for dinner and $5 for Euchre. You do not need a Euchre partner nor do you have to join us for dinner to take part in the Euchre Tournament, just be there and ready to play Euchre by 6:30. We will also have 50/50 and raffle drawings throughout the evening. Please pass the word around and join us. All proceeds will go toward the Museum Roof fund. On Wednesday night October 23 we had a wonderful time at the Pot Luck and Program for our retired Sunfield Telephone Switchboard Operators. We had 75 guests in attendance, the food was delicious and the evening was enjoyed by all. We now have several old box telephones connected to the switchboard at the museum and when you come in you can bring back memories by ringing up the operator. Please keep Sunday, November 24th open for a special event we will tell you all about next week. It's our special Thanksgiving event. Then on December 7th it will be Sunfield Main Street Christmas. As we start out the month of November we would like to thank all of you that have supported us throughout the past 3 years in our venture to making the Welch Museum a destination and a place we all can be proud of. Please stop by and see what new donations we have received, our displays are changing all the time. Our hours are Monday 10 - 4, Wednesday 2 - 5 and Saturday 10 - 2. If you have questions please call Wendel (517)449-6018 or Jan (517)449-4895. As you read this we are in the middle of our busy week and the weather is not cooperating at all. Rain is forecasted for the rest of the week right through the weekend, but you know what, our events will go on as scheduled rain or shine and we will have a great time and hopefully we will raise additional money for the badly needed roof on the museum. Friday, October 25th we will begin our day at 10 am pealing apples and making Apple Butter over a wood fire in a huge Copper Kettle, which has been a family tradition for the Larry & Marilee Steward family for many years. You will again be able to smell the cooking of apples all across town as we begin our 3rd year making Apple Butter as it was made in pioneer days. The cooking will take place again this year behind the Welch Museum in the alley, just follow that wonderful smell of apples cooking and watch the process, you also may be asked to take your turn stirring the apples with that heavy wooden paddle. The process will take two days starting on Friday and ending Saturday when Larry gives us the word that the cooking has finished. If you have extra pint jars you would like to donate to this project, please bring them to the museum as soon as possible or call and we will pick them up. If you would like to help peel apples, be sure to come in and volunteer your time, we appreciate all the help we can get. “Many hands make light work”. Saturday, October 26th we will begin our bi-weekly dinner and Euchre Tournament, this year taking place at Terry's Cafe located at Woodbury just north of the corner of M43/50 and M66 on the East side. Dinner will be served from 5 – 6 p.m. and Euchre will begin at 6:30 p.m. sharp. The cost will be $10 for dinner and $5 for Euchre. You do not have to join us for dinner to take part in the Euchre Tournament, just be there and ready to play Euchre by 6:30. We will also have 50/50 and raffle drawings throughout the evening. Ending the month of October will be the Halloween Trunk-or-Treat that will take place on the Main Street of Sunfield, Halloween night, October 31, from 5-7. Come join us for an evening of fun and treats. The museum has been a busy place and we hope you will stop in and see what has changed, our hours are Monday 10 - 4, Wednesday 2 - 5 and Saturday 10 - 2. If you have questions please call Wendel (517)449-6018 or Jan (517)449-4895. The Welch Museum is gearing up for a busy ending to the month of October with lots of activity. that will be held at the museum and fund-raising for the Museum Roof. Starting off on October 23 the museum will host a pot luck dinner and program which will be presented by the Switchboard Operators of the Sunfield Telephone Company. We hope you will come and bring your children to hear the stories of how the Sunfield Telephone Company was kept busy throughout the era of the Switchboard telephone. The operators will be telling their stories and demonstrate working on the switchboard. The potluck dinner will start at 6 and the program at 7, so bring a dish to share and join us for a fun time. Making Apple Butter over a wood fire in a huge Copper Kettle has been a family tradition for the Larry & Marilee Steward family for many years. On Friday, October 25th you will again be able to smell the cooking of apples all across town as we begin our 3rd year making Apple Butter as it was made in pioneer days over an open fire. The cooking will take place again this year behind the Welch Museum, just follow the wonderful smell of cooking apples and watch the process. Apples are plentiful this year and members of the society and community have been picking up apples for the Apple Butter. Stirring the apple butter is a tedious two day-long task. On Friday morning apples will be prepared for cooking by pealing and coring the apples and then placed in the large copper kettle containing apple cider. The apples have to be stirred constantly with a heavy wooden paddle using a circular motion to prevent them from sticking or burning over the open fire. The paddle is heavy and looks like a boat ore laced with corn husk. If you have extra pint jars you would like to donate to this project, please bring them to the museum or call and we will pick them up. The peeling and preparation for the cooking of the apples will take place in the kitchen area of the museum starting on Friday morning about 10 am and we will finish by canning the delicious Apple Butter on Saturday afternoon. If you would like to help peel apples, be sure to come in and volunteer your time, we appreciate all the help we can get. “Many hands make light work”. There is no time schedule to give you on when the Apple Butter will be finished and ready for sale, as Larry Steward always says “it will be done when it’s done”. Plan on stopping by, we certainly can use your help or just sit for a spell and keep us company while the Apple Butter cooks. Saturday, October 26th we will begin our bi-weekly dinner and Euchre Tournament, this year taking place at the Terry's Cafe located at Woodbury just north of the corner of M43/50 and M66 on the East side. Dinner will be served from 5 – 6 p.m. and Euchre will begin at 6:30 p.m. sharp. The cost will be $10 for dinner and $5 for Euchre. You do not have to join us for dinner to take part in the Euchre Tournament, just be there and ready to play Euchre by 6:30. We will also have 50/50 and raffle drawings throughout the evening. Ending the month of October will be the Halloween Trunk-or-Treat that will take place on the Main Street of Sunfield, Halloween night, October 31, from 5-7. Come join us for an evening of fun and treats. The museum has been a busy place and we hope you will stop in and see what has changed, our hours are Monday 10 - 4, Wednesday 2 - 5 and Saturday 10 - 2. If you have questions please call Wendel (517)449-6018 or Jan (517)449-4895. Another Sunfield Farmers Picnic over for another year, and what a wonderful time everyone seemed to be having and the weather could not have been more perfect. The museum was hopping as usual with new lookers and others returning to see what had been added. many said they didn't see items they had donated but were directed in the right direction and smiles were had by all. Displays change and items are placed in other displays and everything looks new. During the Farmers Picnic on Saturday the Sunfield Historical Society had a booth at the park from Friday afternoon until Saturday night. On Saturday we placed a jar full of different sized candy on the table and offered a free trip on the next bus trip to Owosso for the Old Steam Engine Ride to whoever could come the closest to the number of candy in the jar. Well at the end of the evening about 7:30 there had been many who tried and only one came close enough to win the prize. That person was Donna Kindel from Sunfield who guessed 147 and there was 156 pieces of candy in the jar. Thank you to all that tried to make their guess count and be able to enjoy the trip with us. We will be leaving Sunfield at 10 am on Saturday August 24th and returning after 7 that evening after a full day of travel. We will travel on the Old Steam Engine and probably, without a doubt be 'Held Up' along the way by train robbers. From there we will travel to Curwood Castle which is a small castle now a museum located in Owosso on the banks of the Shiawassee River, built in 1922 and was the home of James Curwood who was born in Owosso on June 12, 1878 and had lived there most of his life. We are told the museum has three stories of wonderful artifacts. Lunch is on us at St Johns. If you want to go, you still have time up until Friday night, August 23rd to make reservations. Give us a call, would love for you to go with us. Another trip to be thinking about is the Au Sable Color Cruise down the Au Sable River on Tuesday October 15th. The leaves should be in full color with their bright reds, gold and yellows all along the Au Sable River. We will travel on the old Paddle Wheeler and the Captain gives you the history of the river and the loggers as we float along with music. It will be a fun day and after we leave the Paddle Wheeler we will have a nice dinner which is included in Au Gras. This trip is filling up fast, so if you wish to go, don't wait give us a call or come and visit us at the museum on Monday 10 - 2, Wednesday 2 - 5 or Saturday 10 - 2. The Sunfield Farmers Picnic will be well underway when you read this week's Sunfield Sentinel and we hope you are planning on enjoying all of the festivities. Please don't forget the All Class Reunion on Sunday, August 18th, the Class of 1963's will be celebrating their 50th anniversary of their graduation. Its starts at 1 pm so bring a dish to pass along with your Sunfield High School memories and come enjoy the fun. The museum has been bustling with visitors this summer on the days we are open. Even days when we are normally closed but we are there working, the door is always open, so stop on in and say "Hello" and give us a chance to sit a spell. We are busy changing the displays again with items that have been donated to us and you will be pleasantly surprised at what you might see. We have a very large display of miniature John Deere tractors and equipment loaned to us by Kevin Feasal, be sure to stop in and take a look. With the additional display cabinets we received from MSU our kitchen area has also been rearranged so that we can display additional donations and give us more work space. Wendel says he needs more space for when he cooks. Our coach trips are well underway, the first was to Shipshewana and then our last trip on July 24th was to Chelsea where we toured the Jiffy Mix factory, Chocolate factory, Teddy Bear factory, ate lunch at the Common Grill and then went to a theater play at the Purple Rose Theatre where we saw "Miles & Ellie". What a fun day we had and we all were tired after that busy day. Our next trip is scheduled for Saturday August 24th where we will have the chance to ride an old steam engine and experience a live “Hold up” along the way, so hold on to your wallet ‘cause Train Robbers have been spotted by the local Marshall. Robbers are likely to take the “money” provided to ride with tickets, it will be a ‘fun’ ride. Following your ride we will be touring the Curwood Castle; it is a small castle,(but 3 stories high) now a museum located in Owosso on the banks of the Shiawassee River. Built in 1922 it was home to Author James Oliver Curwood, who used one of the turrets as a writing studio. James Curwood was born in Owosso on June 12, 1878 and lived here most of his life. Dinner will be included in St John's. The cost will be $95 and the profits from the trip will go toward the roof fund for a new roof on the museum. We hope you will ride along with us. If you are interested please get your reservation in as soon as possible. Please don't wait until the last minute to call Jan (517) 449-4895 or Orpha (517)231-6067. You can also stop by the museum and pick up a flyer telling all the details of each trip. Other trips we are offering are Sauders Village in Northwest Ohio on September 10th, The Ford Museum& Library on September 24th, Au Sable Color Cruise on October 15th, Tommy Dorsey Orchestra on November 3rd, Frankenmuth on November 20th, Branson At Christmas on December 1 - 8th, and Mamma Mia on December 11th. Get your reservations in early, we hope you will travel with us for full days of fun. Have you visited the Sunfield Historical Society website lately? The address is sunfieldhistoricalsociety.com and there you will see lots of photo's that need to be identified and many others that have already been identified. Please come and help us put names to these photo's and bring back memories. We hope you will stop in and say "Hi". We would love to see you soon. Our hours are Monday 10-2, Wednesday 2-5 and Saturday 10-2. We will also open the museum if you request us to do so, just give us a call. If you have an artifact you wish to donate to the museum, please call Jan (517) 449-4895 or Wendel (517) 449-6018. Many changes are taking place at the museum, on Saturday our volunteers decided to investigate whether or not the doors were still able to be opened in the front of the west part of the building. They removed one wooden covering to find an excellent door, it's been painted shut so that will be a challenge to get it opened but will supply a good source of ventilation if we do and also for safety. The building number was still on the door casing, 151. We will have to rearrange some items in the school room to accommodate an open door and is always exciting to see history uncovered. Have you ever waited for something to arrive in the mail and it seems like it would never come? The Sunfield Historical Society applied for their 501C3 which would make them tax exempt through the Federal Government a year ago last May. The lawyer who helped us with the application told us it would be about a year before we would hear if we had been approved or not, and so we patiently waited, and waited, and waited some more. I had a telephone call about 3 weeks ago that brought a glimmer of hope when they needed a bit more info and they would make their decision the following day. Well...... Thursday I received an email that said "Congratulations, you have been approved" and our wait was over. Now we can apply for grants to help fix our roof and also receive donations. On Saturday we had visitors from the Lansing area bringing us photo's of the Welch Family that had belonged to Milton 'Mickey' Dorin, son of Wesley C. & Juanita (Welch) Dorin. Mickey's daughter Jody told us that these were his prize possessions, he kept them in a wooden box on his dresser and every year he would set his children down and tell them all about the people in the photo's and his memories of coming to visit at Sunfield. He was very proud of his family. Mickey passed away last August and the family donated the photo's to the museum for all to see and enjoy. I will be putting them out on the website soon, so be sure to check them out. The website address is sunfieldhistoricalsociety.com I continue to place new photo's on the website that need to be identified and also some that don't, they are there to share. Hope you visit the website soon. We hope you will stop in and say "Hi". We would love to see you soon. Our hours are Monday 10-2, Wednesday 2-5 and Saturday 10-2. If you have an artifact you wish to donate to the museum, please call Jan (517-449-4895 or Wendel (517)449-6018. Last Tuesday was our first trip planned to raise funds for the museum. The museum is in desperate need of a new roof and with 100% of the commissions from these trips going to the roof fund, we are hoping to take a big bite out of the cost. the cheese factory. (it was still raining) We arrive at the cheese factory and the rain stopped and the sun peeked out and we knew we were in for a fun day. The cheese factory was great, we could watch the cheese making through large windows and see the large vats of milk being turned into cheese. We sampled every kind of cheese they made which were delicious and of course, we all bought our favorites to bring back home with us, the price was outstanding. We arrived at the Shipshewana Flea Market and everyone was anxious to get off the coach and into the flea market to see what treasures they could find to bring back home. They were there several hours and all met back at the coach at 2:30. We stopped at the "E & S Bulk Food Store" where they had things grown by Amish, made by Amish, and sold by the Amish. It was a great experience. After the food store we traveled to Das Dutchman Essenhaus for a delicious dinner served family style. When we were seated to our delight, our dessert was already next to our plates. We had every kind of pie on the table you could imagine, and oh so delicious. They started bringing out the food and everyone ate until they could eat no more. Moans and groans and "I ate too much" could be heard all the way home. We arrived back in Sunfield at 7 pm. Our next trip is scheduled for July 31 where we will travel to Chelsea Michigan. 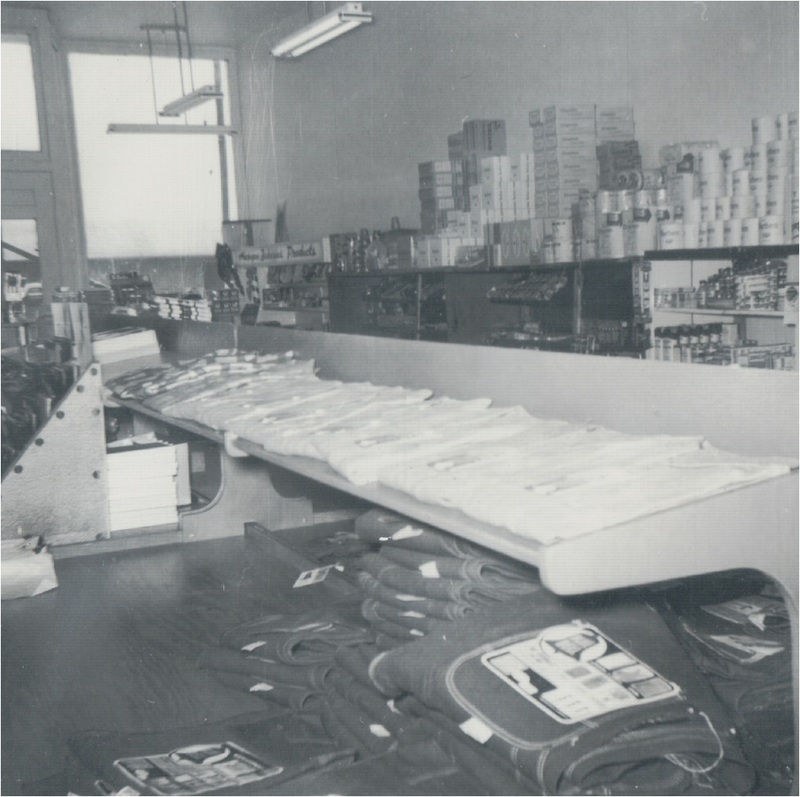 This is going to be a very busy day that I know you are going to enjoy, we will tour the Jiffy Factory first, you will be able to purchase any of the Jiffy products and if you are cooking for only one or two, these are perfect! Next we are going to take you to the Teddy Bear Factory in the old Clock Tower Complex, where you will be amazed viewing 100,000 bears and maybe buying one for yourself or Christmas. Next on this wonderful tour is dinner (which is included) at the elegant “Common Grill.” After dinner you will attend the delightful comedy love story of “Miles and Ellis” at the Purple Rose Theatre. We hope you will travel with us. We are changing displays again at the museum so be sure to stop in and see things that have been stored in the back room until we had room to bring them out. Our new display cases have been placed and this gives us more display areas. We will again go to MSU this next week and get more, they are a great asset to the museum. Our webpage sunfieldhistoricalsociety.com is progressing nicely, we are placing many of the photo's from John & Gloria Nelson on the website that need names put on them. There has been a great response to help name the photo's and when they have been named the photo's will be placed on the website pages so you can continue to view them. Please take the time to visit the website, we need your help. We hope you will stop in and say "Hi". We would love to see you soon. Our hours are Monday 10-2, Wednesday 2-5 and Saturday 10-2. If you have an artifact you wish to donate to the museum, please call Jan (517-449-4895 or Wendel (517)449-6018. Here we are at the end of June already and it seems like it was only the first yesterday, how does time slips away from us so quickly. I guess when we keep busy and fill our days to capacity, this is what happens. With the first bus trip to Shipshewana within a couple of days we are busy trying to make sure everything is set and ready for a fun day. We have had several calls wanting to know how much of the commission goes to the roof fund, the answer is simple, 100%. We are in need of a new roof to protect our collection from the rain and elements. This week's photo's from the Nelson collection are street and buildings on Main Street Sunfield. I believe they were taken in the mid 1950's. We hope you will stop in and say "Hi", set down and have a cup of hot coffee with us, or a bottle of cold water, whichever is your choice. We would love to see you soon. Our hours are Monday 10-2, Wednesday 2-5 and Saturday 10-2. If you have an artifact you wish to donate to the museum, please call Jan (517-449-4895 or Wendel (517)449-6018. Did you hear the pounding of hammers on Saturday coming from the museum? If you did all the noise was from our volunteers working on the new displays. These were given to us by MSU and will make a great addition to the museum. Be sure to stop in and give us some suggestions on what you would like to see displayed in them. We need some fresh new ideas. 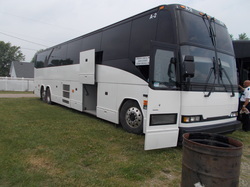 Final plans are being made for the bus trip to the Shipshewana Flea Market next Tuesday, June 25th, if you have not signed up to go, be sure to call Jan (517)449-4895 or Orpha (517)231-6067 by Monday to see if there is a seat available. We would love to have you go with us. It will be a fun day to tour the Cheese Factory, spend some time browsing the flea market and town of Shipshewana and then end our day at Das Dutchman Essenhaus for dinner where you can eat until you can eat no longer if you so wish. Please remember, 100% of the commission from these bus trips goes to the Museum Roof Fund to put a new roof on the museum. We need your help to make this happen. 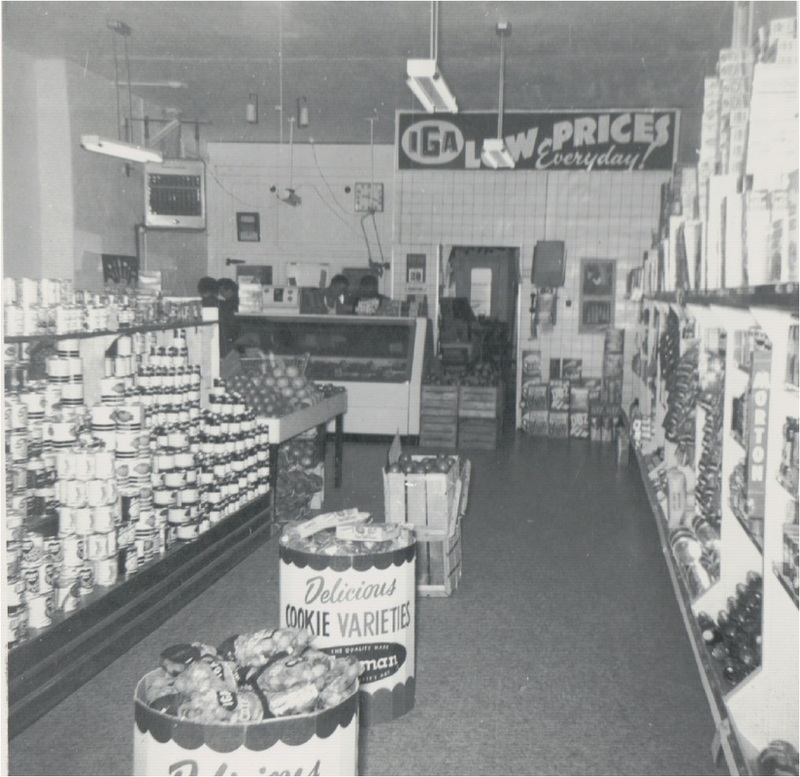 I am enclosing this week several photo's of the IGA Super Market located near the southwest corner of Main Street and Second Street. 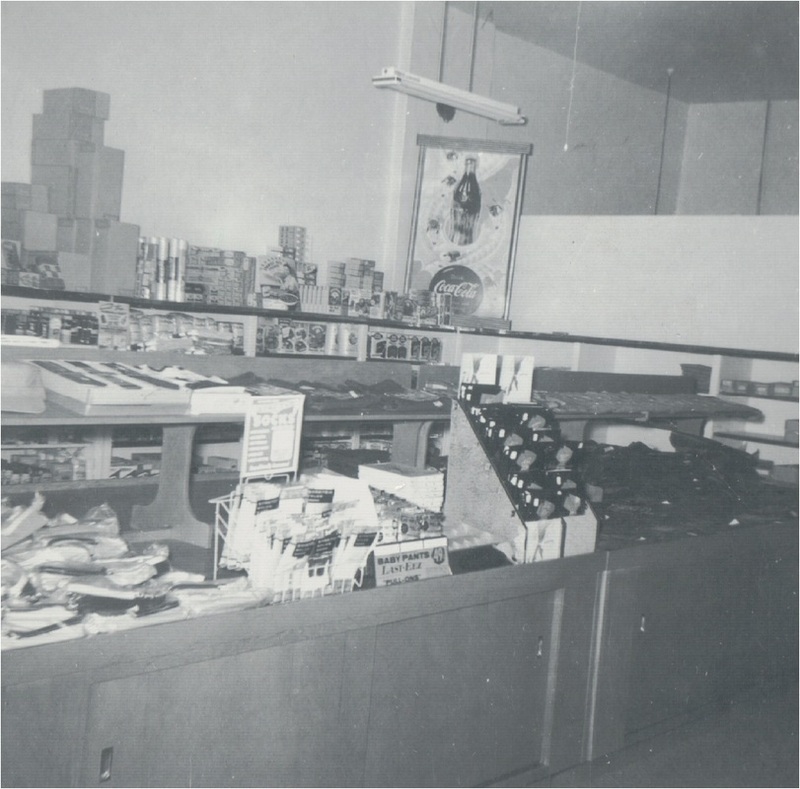 You can also see part of the Kirkland Drug Store. 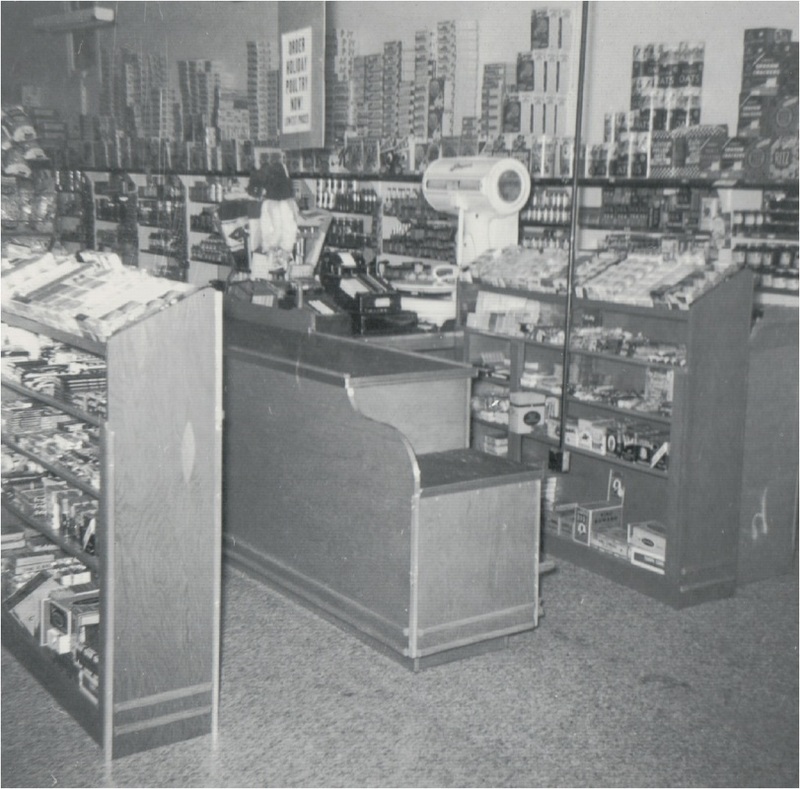 These photos were taken in 1955 when the store was owned by Ethelyn and Ray Elliott. The buildings are gone now and there is only an empty lot. 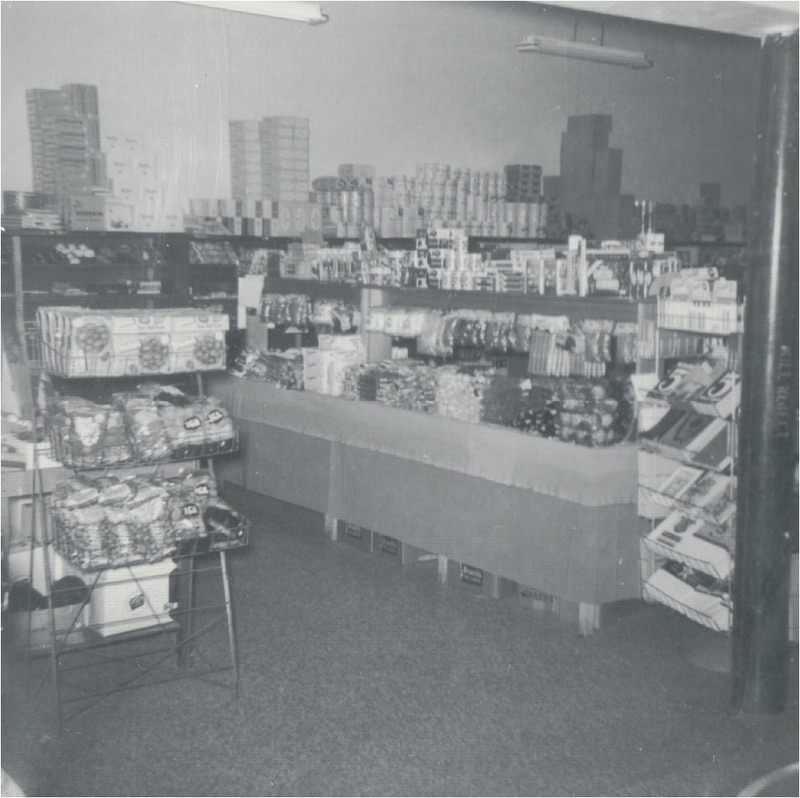 Thanks to John & Gloria Nelson and their love of Sunfield, we are able to even view what it was like inside the store. Bring back memories? I can still see Winston Ives standing behind the meat counter waiting to help. Other trips planned; Home of "Jiffy" Mix, Teddy Bear Factory, Purple Rose Theatre on July 31; Centreville Antique Market, Gilmore Auto Museum on August 11; Owosso Train Robbery Ride and Curwood Castle on August 24th; Paddle Boat on the Au Sable River Color Tour and dinner on October 15th; Chicago Christmas Shopping and Tommy Gun's Garage Dinner Theater& Chicago's Roaring Twenties on November 14th & 15th and Kalamazoo Miller Auditorium to see "Mamma Mia!" and Dinner on December 11th. Last week I talked about receiving a collection of Sunfield Sentinels and photo's of Sunfield and vicinity from Keith Hampel that belonged to John & Gloria Nelson. Keith was their estate administrator. I was able to find John's obituary and learned that John Nelson was born in New York City, New York. His mother died shortly after his birth and John was placed in an orphanage. Later it is believed that a married couple of New York City took John in as their son and moved to Michigan, but didn't adopt him. John attended a trade school and majored in printing. After completing his apprenticeship he worked for the Wyandotte News, later he went to work for the Plymouth Mail. After serving in the National Guard, and WWII, he rejoined his job at Plymouth Mail. John Nelson and Gloria Lynn Clark were married in 1952. She also worked in the Plymouth Mail. The newly-weds talked about owning their own independent weekly newspaper and on July 20, 1953 their dream came true, John and Gloria became the new owners of the Sunfield Sentinel. The Nelsons purchased the Sunfield Sentinel from Winston Cheal. After 37 years of publishing weekly newspapers, the Nelsons retired in July 1990, selling to the present owner, Jerry Maurer. John and Gloria were very active in the Sunfield Community, you could always see Gloria out on the street with her Polaroid camera snapping pictures for the newspaper, and we are grateful to her for the photo's she has saved all of these years. We will share these with you as Jerry has room in the Sentinel. The museum has been a busy place and we hope you will stop in and see what has changed, our hours are Monday 10 - 4, Wednesday 2 - 5 and Saturday 10 - 2. If you have questions please call Wendel (517)449-6018 or Jan (517)449-4895. I sure wish this weather here in Michigan would make up its mind, first it's so hot we can hardly breathe or be outside and then it's sweatshirt weather the next day. Oh well, it's finally gave up the rain we seemed to be having every day, so maybe the farmers can finish getting their crops in the ground. "WE HAVE RUNNING WATER!!" in the kitchen as well as the bathroom, (and this time not dripping from the ceiling onto the floor). Thank you Bob Avery, Doug Schmuck and David VanDerVenter. It is so nice to be able to go to the kitchen for a bucket of water and not have to bring it from home or attach a hose at the bathroom sink. MSU has donated to us several large display cases that they no longer use, all we have to do is pick them up soon. This will make a great addition to our museum for more surface display. It seems like we have plenty of room but not enough surface to display the small things, we do a nice display and then have to take it back down so we can display new items. David VanDerVenter brought into the museum and donated a solid copper beer mug and smaller mug from the Tivoli Brewing Company he purchased at a garage sale. In researching the Tivoli Brewing Company, I find that it was a four-story brick structure built in 1882 located in the Auraria Neighborhood of Denver, Colorado. The complex housed the Milwaukee Brewery company, an early Denver brewery. In 1901 the company merged with the Union Brewing Company to form the Tivoli-Union Brewery Company. With the exception of a break during Prohibition, the plant operated continuously until the mid-1960s. Today, the building is home to the Tivoli Student Union of the Auraria Campus, serving as a student center for the Metropolitan State College of Denver, the University of Colorado Denver, and the Community college of Denver. While it is now used as meeting rooms and student group offices, many of the historic features still remain, including the copper brewing kettles and a barrel lift that is visible from two levels. We also had visitors from Lake Odessa that donated items from John and Gloria Nelson, previous owners of the Sunfield Sentinel. I will be telling you all about this donation next week. These items need to be sorted photographed and cataloged. We are again open on Monday 10-2, Wednesday 2-5 and Saturday 10-2 and hope you will find the time to visit and see all of the new items that have come into the museum. If you have questions please call Wendel (517)449-6018 or Jan (517)449-4895. We look forward to seeing you soon At The Museum. May Daze has come and gone again for another year, it was a beautiful day to have the event, (even thou it rained in the early afternoon) and we certainly were busy at the museum with visitors coming in to check out our vendors, get lunch from the Sunfield General Store and tour the museum. We heard many compliments about all of the changes we have made over the winter time and how much they enjoy visiting. Our coming week is going to be a busy one, Tuesday, May 21 we will be hosting the Tri River Small Museum Group for their monthly meeting and then afterwards we will treat them to a nice meal of Chicken & Biscuits. We were supposed to have hosted their meeting last month but because of all of the water from our heavy rain storms we had to cancel. Friday, May 24 the Sunfield Elementary 4th grade classes will be visiting the museum at noon and stay throughout the afternoon. They will eat a sack lunch with us and then enjoy the planned activities until time to pack up and walk back to school to catch their bus. Their plans had to be changed also with all of the water problems, but now that that is in the past we can enjoy their visit. The Avon has left the building, we want to thank Rhoda Lee (Way) Greenhoe and her brother Harry Way for their donation of the pre-1976 Avon collection from their mother, Rose Way. We put it all out on tables (12-8 foot tables to be exact) and during May Daze much of the Avon found a new home. We did keep enough of the really unique bottles to do a nice display in honor of Rose Way. This past week Sunny Crest Trading Post came and picked up the remaining collection and so all is not lost if you want to see what is left. We received a generous donation for the Roof Fund from Mr. Thomas Westfall of Grand Ledge. Thank You Thomas, with your help our Roof Fund is growing. Please don't forget to donate your empty pop and beer bottles, those dimes all add up to help. Our "Genealogy Room" is beginning to take shape and we are hoping to get all of our records out of storage and in one place soon so that we can help those that wish to work on their genealogy. If for some reason you are unable to stop by the museum, just drop us a letter and let us know what you are researching and we will certainly try to help you find the answers. Genealogy is a wonderful past-time but when we all hit those brick-walls everyone talks about and we cannot find the answers we are looking for, it can be difficult. This is a free service the Sunfield Historical Society offers, so take advantage of the offer and write to us at P.O. Box 251, Sunfield, MI 48890. We will be closed both Saturday May 25th and Monday May 27 of Memorial Day weekend so our volunteers can also enjoy the holiday with their families. We will again be open on Wednesday, May 29th 2 - 5. We hope you will stop in and visit with us. Our regular hours are Monday 10 - 2, Wednesday 2 - 5 and Saturday 10 - 2. If you have a question or wish to call our numbers are Wendel (517)449-6018 or Jan (517)449-4895. Another busy week at the museum trying to get everything back into its place after all of the water. There was no damage to any of the artifacts, just water on the floors everywhere. The 3 tarps have been installed on the roof to try to stop some of the water from coming into the building and so far they have not been tested as the heavy rain has stopped. We were open both Saturday and Sunday of this last week for the Spring Into The Past tour of small museums. We has some visitors from Belding, Saranac, Ionia, Charlotte & Lake Odessa. They enjoyed their visit to the museum. Saturday is our 2nd Annual May Daze on the Main Street of Sunfield. We hope all of you will take time to come to Sunfield and enjoy the day browsing the Welch Museum, Mapes Furniture Storewide Savings, Specialty Vendors, Library Book Sale, Food Vendors, the Sunfield Coffee Co. Menu Special and Face Painting, Sunny Crest Trading Post 50% off, Backwoods Bar, Flea Market and much more. Hours are 9 a.m. to 5 p.m. Bring your old Car or Tractor, park it on Main Street and show it off. Come early and enjoy the day. A new light fixture has been installed outside the building over the sidewalk. It is an antique light fixture that was used on the Main Street of Sunfield before updating several years ago. Be sure to check it out. We want to say THANK YOU for the donations we received this week of bottles to be returned for the roof fund. With your continued support we will be able to keep the Welch Museum open during the summer. If anyone is interested in making a donation to the Roof Fund at the Welch Museum, contributions can be sent to P.O. Box 251, Sunfield, MI 48890. Rain, Rain, GO AWAY!! (PLEASE) were the words echoing throughout the museum all last week as we tried to keep up with the water drips which, were all over the museum. We even had drips in areas that were dry in the past. We were just thankful that we had plenty of plastic to try to keep the collection dry. It was a job trying to keep up with the water buckets as they filled almost as fast as we could empty them. There were times when we began to think we surely would lose the battle. We desperately need a new roof for the museum. We would like to ask if anyone has an idea for a fundraiser to please let us know, you can either stop by or send it through the mail at PO Box 251, Sunfield. We had a visitor this past week during the storm and he was surprised to see how bad the roof was leaking and he suggested that maybe we could put waterproof tarps over the roof to help and the following day he delivered 3 large waterproof tarps to give us a start. If you or any of your friends have tarps that you think might help and you would like to donate them, please let Wendel know, his phone # is 517-449-6018. We are willing to try anything that might help. We are sorry the Museum was closed this past Saturday without notice, but with the floors being wet and slippery we thought it best not to take the chance that someone might fall and get hurt. We even had to cancel our hosting of the Tri-River Small Museum Group scheduled for Tuesday, April 16th for the same reason. Many activities are being planned at the museum; on April 25th the 4th grade students from Sunfield Elementary will be visiting for a fun day. May 4 & 5 it is “Spring Into The Past”, this is a weekend that all of the small museum’s are open, free of charge for those that normally charge admittance from 10 – 5. We have booklets that show where all of these museums are located if you want to stop in and pick one up. Saturday, May 11th is May Daze on Main Street of Sunfield. Many activities are being planned for a full day of fun on Main Street. If you know of an organization or person that would like to set up a booth on the street for the day, be sure to get in touch with the museum or Becky at Mapes. On Tuesday, May 14th we will again attempt to host the Tri River Small Museum Group. We hope you will stop in and see us when you are in town, we are open on Saturday’s from 10 – 2 pm, and we look forward to seeing you soon. If you need assistance about museum events, information, a loan or donation please call Jan (517)449-4895 or Wendel (517)449-6018. The warm weather was great this past weekend and the museum was buzzing with activity as usual. We received a huge donation of pre 1972 Avon bottles, and I cannot begin to tell you how many bottles there are. We are in the process of dusting them off and putting them out on tables for everyone to look at and then we will be letting everyone know what we will be doing with them. The donation was received from the family of Rose (Nosotti) Way from the Mulliken area. Rose began selling Avon in 1971 and was an avid collector until her untimely death on October 1, 1976. Many of you, (as I did myself) always looked forward to Rose ringing the doorbell and saying “Avon Calling”. Be sure to stop in and view her collection. You will be amazed. If you know of any Avon collectors that might be interested in the bottles, please let them/us know. Tuesday, April 16th we will be hosting the Tri River Small Museum Group for their monthly meeting. We became members of this group last year and have gained knowledge from other small museums in Michigan. I announced a couple of weeks ago about our new webpage, sunfieldhistoricalsociety.com which has been a work in progress. Please visit again and see all the information and photo’s that have been added this past week and be sure to let us know what you would enjoying seeing on the site. Until next time, we hope to see you soon “at the museum”; we are open Saturday’s 10 am – 2 pm. If you have questions be sure to email us at sunfieldhistoricalsociety@gmail.com or call Wendel (517)449-6018 or Jan at (517)449-4895. The museum was again open on Saturday and we were pleasantly surprised by the number of visitors who came in and braved the cold with us. Thank you for visiting. Some that visited came to see what had been in the big box they saw on Facebook. In last week Sentinel I showed the picture of the Mountain Lion or Puma. I wrote it was a panther as I had been told and later thought “oh, oh, I will be corrected on that mistake for sure”, only to find out that in some places these cats are also called cougars, catamounts, painted cats or panthers. So, I guess I wasn’t wrong. Anyway, she is beautiful and hope all of you will stop in and look. I also forgot to put in a picture of the deer mount last week, so I will include it this week. Our volunteers finished constructing the corn-crib this week, now we are in need of some artificial ears of corn, real corn will only attract mice and we don’t need them for sure. Joyce Martin brought us in some chickens for the barn, (not real ones of course) and we are still looking for a calf, pig, and other artificial animals for the barn. The school children will be visiting the museum the last week of April and we would like it furnished by then if possible. Last year the Saturday before Mothers Day, Main Street of Sunfield was a busy place with many activities, even though it rained off and on all day. This year the date for “May Daze” is Saturday, May 11 and we are looking for any organization or person that would like to set up a tent/table and display and sell/demonstrate their wares. We would like to hear from you as soon as possible. You can call Wendel at 517-449-6018 or Jan at 517-449-4895. Please spread the word for another successful event. The Sunfield Historical Society/Welch Museum now has a new webpage, the address is: Sunfieldhistoricalsociety.com. It is a work-in-progress, so please be patient, look us over and let us know what you would like to see on the site, there is a contact page, so let us know you visited and what you would like to see on the site. The museum will be open on Saturday’s, 10-2 or by appointment. Stop in and check us out, new arrivals every day we are open.